SB216763 is a potent and selective GSK-3 inhibitor with IC50 of 34.3 nM for GSK-3α and equally effective at inhibiting human GSK-3β. CHIR-98014 is a potent GSK-3α/β inhibitor with IC50 of 0.65 nM/0.58 nM in cell-free assays, with the ability to distinguish GSK-3 from its closest homologs Cdc2 and ERK2. Western blotting (D) in U937 cells following 16-hour exposure to BEZ235/ABT-737 (0.5 μmol/L each) in the presence or absence of BIO, MeBIO, or CHIR-98014 (2 μmol/L each). TWS119 is a GSK-3β inhibitor with IC50 of 30 nM in a cell-free assay; capable of inducing neuronal differentiation and may be useful to stem cell biology. Fig.6. TWS119 enhanced the cellular expression of ADRP by inhibiting GSK-3β activity. A: GSK-3β kinase activity was evaluated in HKC cells in the control group and the TWS119-treated group. *Indicates P < 0.05 vs. control group. B: Western blotting analysis was used to clarify the effect of 10 μM TWS119 on SREBP-1 expression (mean values±SD, n = 6). *Indicates P < 0.05 vs. blank control group. C: Immunofluorescence was applied to detect the expression of ADRP in the control and TWS119-treated HKC cells. Tideglusib is an irreversible, non ATP-competitive GSK-3β inhibitor with IC50 of 60 nM in a cell-free assay; fails to inhibit kinases with a Cys homologous to Cys-199 located in the active site. Phase 2. (A) NPCs were treated with 3µM of the GSK3 inhibitor (tideglusib) for 24 hours. Representative images of untreated SPG11-NPCs (SPG11‐NT) and tideglusib-treated SPG11-NPCs (SPG11-Tide) on day 3. Cell proliferation was analyzed using colabeling of PCNA in Nestin/Sox2-positive NPCs. Nuclei were visualized with DAPI. Scale bar = 50µm. (B) Increased numbers of Nestin/Sox2‐positive cells colabeled with PCNA in CHIR99021-treated SPG11-NPCs. (C) Tideglusib-treated SPG11-NPCs, compared to untreated NPCs, revealed restoration of cell proliferation similar to the CTRL‐NPCs. LGX818 downregulates CyclinD1 dependent of DYRK1B, but not GSK3β. (B) A375 cells were treated with vehicle or an inhibitor of GSK3β (SB415286, 12.5 μM), then they were treated the same as in (A) for 3 and 12 h, IB analysis for β-catenin, Cyclin D1 and GAPDH. 5-bromoindole is an important pharmaceutical chemical intermediate and a potential inhibitor of glycogen synthase kinase 3 (GSK-3). 2-D08 is a cell permeable, mechanistically unique inhibitor of protein sumoylation. It is also inhibits Axl, IRAK4, ROS1, MLK4, GSK3β, RET, KDR and PI3Kα with IC50 values of 0.49, 3.9, 5.3, 9.8, 11, 11, 17 and 35 nM respectively in biochemical assays. BIO is a specific inhibitor of GSK-3 with IC50 of 5 nM for GSK-3α/β in a cell-free assay, shows >16-fold selectivity over CDK5, also a pan-JAK inhibitor. 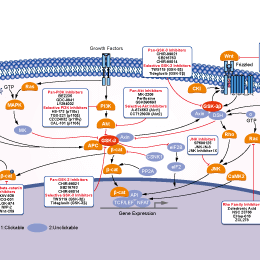 (C) Macrophages were incubated with cAMP, oxLDL–PON1 alone or in the presence of LXRa inhibitor (SR9243 1 μM), PPARc inhibitor (T0070907, 1 μM), NEM (10 μM), or oxLDL. Data are expressed as means±SEM. **P < 0.01, ***P < 0.0005, ****P < 0.0001. AR-A014418 is an ATP-competitive, and selective GSK3β inhibitor with IC50 and Ki of 104 nM and 38 nM in cell-free assays, without significant inhibition on 26 other kinases tested. The impact of GSK3β inhibitor TDZD-8 (10 μM) on the GSK3β phosphorylation (A), the protein expression (B) and mRNA level (C) of α-SMA and collagen I in acetaldehyde-induced HSCs activation. The data were representative of at least three independent experiments. All values were expressed as mean ± SD. *P < 0.01, ***P < 0.01 vs. the control group, #P < 0.05, ##P < 0.01, ###P < 0.01 vs. the acetaldehyde group. LY2090314 is a potent GSK-3 inhibitor for GSK-3α/β with IC50 of 1.5 nM/0.9 nM; may improve the efficacy of platinum-based chemotherapy regimens. LY2090314 is highly selective towards GSK3 as demonstrated by its fold selectivity relative to a large panel of kinases. (D) GS87 leads to more effective AML differentiation than other clinically used GSK3 inhibitors. HL-60 cells were treated with GS87 (30 μM), Tideglusib (30 μM) or LY-2090314 (30 μM) for 72 hours and differentiation was measured by the NBT assay. * p<.05; **p<.01. Inhibition of GSK-3β promotes Runx2 induction. Vascularsmoothmusclecells(VSMCs) were treated with or without IM-12(3 μM) for 24h, and cells treated with β-GP (10 mM) were as a positive control. The cell lysates were immunoblotted with antibodies against Runx2 and β-actin, respectively. BIO-acetoxime is a potent dual GSK3α/β inhibitor with IC50 of 10 nM, >240-fold selectivity over CDK5/p25, CDK2/cyclin A and CDK1/cyclin B.
Indirubin is a potent cyclin-dependent kinases and GSK-3β inhibitor with IC50 of about 5 μM and 0.6 μM. Effect of indirubin on the alterations of actin cytoskeleton in TNF-α-treated RA FLS. F-actin (red) and nucleus (blue) were stained with phalloidin and DAPI, respectively. Bikinin is an ATP-competitive Arabidopsis GSK-3 inhibitor, and acts as a strong activator of brassinosteroid (BR) signaling.